Think this is the right time to express your feelings to your loved one? Buying a heart pendant is a great idea. These heart shaped pendants are a sign of love and have romance written all over them. The pendants are light and their designs will melt your loved one's heart. Why settle for a cliche pendant when your partner deserves this heart melting pendant. If you think it's time to take your relationship to the next level, say it with a nice ring. 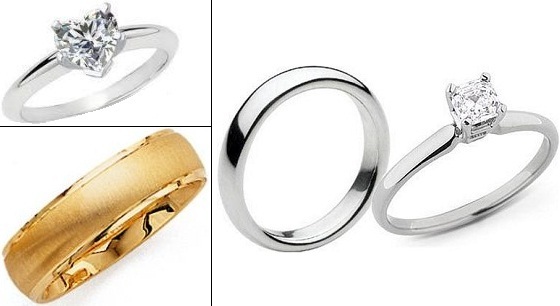 These rings are a symbol of love and commitment. Buy a ring only if you are truly serious about your relationship. You don't want to drive wrong signals and mess things up, right? These keychains are just too adorable. If you are looking for a sweet little gift for your loved one, here is your best bet. These high-quality keychains are carefully packed and delivered to your special someone. If your partner values the little things in life, any one of these keychains will surely bring a smile on her face. These mugs are perfect for couples who love to have nice long conversations over a cup of coffee. Gift one of these fantastic mugs to your partner and remind them of the time they have spent with you. Actually, gift two mugs so that they invite you over coffee sometime. These never fail. If your partner is fond of sweets, you can consider buying any of these sweet boxes this Valentine's day. These chocolates and cakes act as great companions with your actual gift. There are romantic Valentine's day gifts and then there are cute Valentine's day gifts; soft toys certainly belong to the second category. These adorable plush toys will make your loved one jump with joy. Make your Valentine's day memorable with our range of soft toys. They are cute, soft and cuddle worthy. These couple gifts are something that complement each other flawlessly. They signify the perfect bond. Choose from our selection of couple gifts like these pillow covers that are a symbol of warmth, the couple watch set for the trendy duo or the mug set which symbolises meaningful conversations.